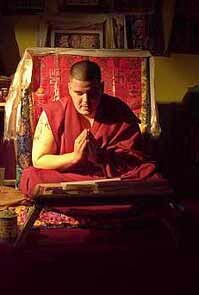 Jack Churchward was born July 15, 1982 in Dunedin, Florida to Jack and Cynthia Churchward and was recognized at an early age to be an incarnation of Thadag Tulku Rinpoche, a highly realized lama (ordained teacher of Buddhism) earning the title Rinpoche, or 'precious one'. A tulku is a realized Buddhist lama that chooses to be reborn, often many times, to continue their Bodhisattva vows of benefiting all sentient beings. His rebirth in the West to a Christian family, who began practicing Tibetan Buddhism when Rinpoche was about 4 years old, was an appropriate birth for Tulku to benefit the most sentient beings. When Rinpoche was young he showed many signs of realization. His actions where based on unbiased compassion towards all beings. From the smallest ant to the closest friend he saw preciousness in each sentient life. Rinpoche first took Refuge with Khenchen Rinpoche at the age of 5 and was given the name Konchok Dorje. His Holiness the Drikung Kyabgon Chetsang visited Rinpoche's family shortly after Rinpoche reached age 7. After visiting and speaking with Rinpoche about Rinpoche's visions during meditation, His Holiness Chetsang Rinpoche, proclaimed him to be a reincarnate Lama of the Drikung Kagyu Lineage, a Tulku. In an ancient & elaborate ceremony in Dehra Dun, India, monks shaved Rinpoche's head and prepared Rinpoche for his enthronement. The ritual was lead by His Holiness Drikung Kyabgon, Chetsang Rinpoche and other head Lamas of the Drikung Kagyu order. He was draped in maroon robes of a Tibetan Lama, offered Katags, texts, ritual implements, a Jigten Sumgon Statue and proclaimed the 6th consecutive incarnation of Thadag Tulku Rinpoche from Katsel Monastery in Tibet as well as the incarnation of the Bodhisattva Lodo Rinchen found at the top of the Drikung Kagyu Lineage Tree next to Vajrapani, just under Vajradhara. Nearly a century ago, Thadag Tulku Rinpoche was one of the head Lama's who ran the Katsel Monastery near Lhasa, Tibet. His enthronement was on November 10, 2000 at Jang Chub Ling Monastery in Dehra Dun, India at the Snake Year Teachings at which time he took His Holiness the Drikung Kyabgon Chetsang as his Root Lama. The name he was given at his enthronement was Konchok Tenzin Sherab Woser Pel Sangpo. This is Rinpoche's sixth incarnation as Thadag Tulku Rinpoche. His monastery is from the Drikung Kaygu lineage of Tibetan Buddhism. Thadag Tulku Rinpoche was a key figure in the Drikung Kagyu Lineage. In previous lives, he taught disciples profound techniques of the mind including the Ganges Mahamudra, as the Bodhisattva Lodo Rinchen. Before taking form as Thadag Tulku, Rinpoche was the Bodhisattva Lodo Rinchen who is located on the Drikung Kagyu Refuge Tree just below Vajradhara and to the right of Vajrapani. In a previous incarnation of Thadag Rinpoche he was considered to be one of the Great Masters of the Drikung Yangzab Dzogchen. Rinpoche has received many Empowerments, Transmissions and Teachings from His Holiness the Drikung Kyabgon Chetsang, His Eminence Tritsab Rinpoche, His Eminence Triptrul Garchen Rinpoche, His Eminence Ayang Rinpoche, the Venerable Druwang Rinpoche, the Venerable Khenchen Rinpoche, the Venerable Lamkyen Gyalpo Rinpoche, the Venerable Lho Kunsang Rinpoche, the Venerable Traga Rinpoche, the Venerable Choeje Togden Rinpoche, the Venerable Drupon Samten Rinpoche, the Venerable Khenpo Sherab Rinpoche, the Venerable Ontul Rinpoche, the Venerable Drupon Thinley Ningpo Rinpoche, the Venerable Khenpo Tsultrim Rinpoche, Lama Trinley Dorge, the Venerable Lama Sonam Rinpoche who came to America to tutor Rinpoche at length and many other Drikung Kagyu Lamas. Rinpoche has made two pilgrimages to India and has attended many retreats in Arizona with His Eminence Garchen Rinpoche (who he considers his Heart Lama) as well as numerous retreats in Vermont, Maryland, Boston and various Center's in Florida. Rinpoche has not yet been to Katsel Monastery in Tibet or met the Venerable Nyidak Rinpoche, however he does communicate with him in Tibet. Thadag Tulku Rinpoche today has been a key figure to the success of Katsel's growth here in the West. Rinpoche's residence at Katsel Dharma Garden in Clearwater, Florida has helped bring many people to the path of peace and enlightenment. With treasured spiritual advisors & dedicated practitioners, Rinpoche's enlightened activities are present in all of Katsel's members. His dedication to the benefit of others has created a space now in the West for people to find the Dharma. Continuing its mission to serve the community, Katsel offers free classes on Tibetan Buddhism. These classes are taught by Ani Jampa and Ani Wangmo, both Drikung Kagyu Tibetan Buddhist nuns, and close friend's of Rinpoche. This Florida center also hosts many visits from realized Masters of the Drikung Kagyu Lineage. May Rinpoche's compassionate intentions continue for limitless time to be the source of benefit for others as he continues to practice the Dharma in a very traditional authentic manner as it has always been from master to student. 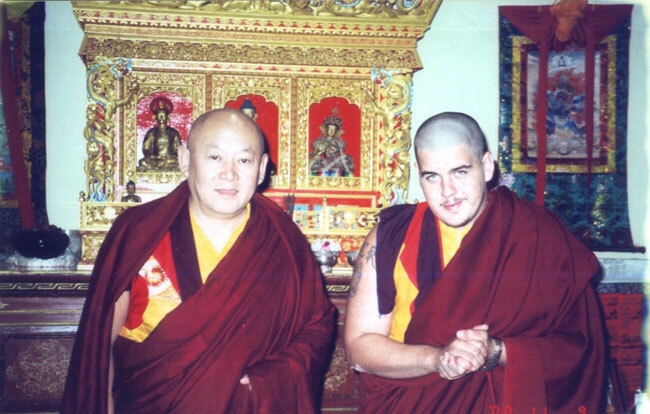 The St. Pete Times wrote an article about Rinpoche that appeared front page on 02/25/01. FOX 13's Charlie Belcher did a story on Rinpoche when he spoke to a World Religions class at his former high school, Clearwater High on 03/09/01.